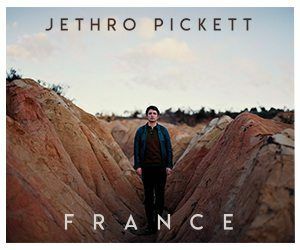 Written and recorded between Dublin and Melbourne, Jethro Pickett’s sophomore album ‘France’ is a bold and daring journey into his world. While at times it can be a little over ambitious musically, he evolves his sound in new and interesting ways which ultimately pay off in the end. Folk music is still the basis here but there are elements of psychedelic rock, flirtations with jazz and a sprinkle of soul for some good measure. It’s this mix of styles which keeps the record from becoming too one dimensional in the long run. Regret and wasted potential are both recurring themes on the LP as they both appear in different contexts, whether it relates to a relationship or the path we take in life. Opener Gene is a good example of this as he paints the picture of someone who is caught up in the web of the music industry and can’t get out. From the viewpoint of the songwriter he can see their potential as he sings, “You could have been a star by now.” Throughout the album his insights and observations add a new layer to the music; the way he uses his words draws you into the story that he is trying to tell. One of the most notable influences on the album is The Beatles – more specifically their experimentation with Indian classical music. An Introduction is a wonderful homage to that time period without it ever feeling like an imitation. It also works wonderfully as a transition into one of the more striking tracks on the album, Everything. This more upbeat rock number really stands out on the LP compared to some of the more traditional folk songs. It’s also more upbeat lyrically as he proclaims during the refrain that “Everything will be alright”, even though he’s singing about a relationship coming to an end. The title track France on the other hand is both a swift change in tone and timbre, which again highlights his ability to set a scene. This time he is singing about a friend whose relationship appears to be on the rocks. “Did he meet someone in France/ did he ever stand a chance/ perhaps you knew it all along/that man for you was wrong,” In just a few words he perfectly sums up the state of affairs. The jazz inspired instrumentation also adds some real flair to the track and gives it an air of mystery and despair. Amidst all those tales of love and heartbreak there are moments for reflection and introspection. On The Mystics’s Trip we hear Jethro taking time to gather his thoughts and the result is some of his most poignant lyrics on the record. You really feel he has a grasp on the modern condition with lyrics like “Inspired by the rush of things/all this ambition can leave you cold/the warmth of memories is fragile and in control”. He perfectly captures how our society is obsessed with progress at the expense of everything else and it’s only after the fact that we realise what we have missed out on. It’s that level of subtext in his lyrics that makes him stand out amongst his peers. There are times on the album where the music itself can be overbearing and instead of adding to the music it takes away from it. Like Peace or Trauma starts out as a straightforward acoustic number but it eventually morphs into a psychedelic trip with shuddering guitar chords and backward guitar lines. It serves its purpose as a transition into a much calmer outro, but it feels both jarring and chaotic and ultimately out of place in the song itself. This sort of experimentation makes the record feel a lot less unpredictable musically, but there are times where it could have been toned down. What really shines through on ‘France’ is its message and how it’s one that feels incredibly apt for our times; as the pace at which we live increases, the harder it is to slow down. There are more universal themes on the LP like love, despair and regret, but it’s the amalgamation of these themes that really brings the album together. That’s what makes it such an intriguing record, it fuses the storytelling of the likes of Bob Dylan and Neil Young with a more modern observational approach akin to Courtney Barnett. Ultimately, If honesty was a commodity Jethro Pickett would have an abundance of it, as ‘France’ is an honest portrayal of his struggles as well as the struggles of those around him.